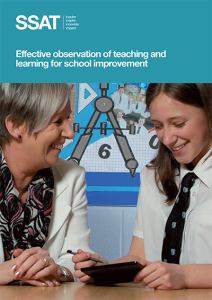 A collection of best practice theory, resources, case studies, lesson films and training activities that are suitable for use at all levels of the school hierarchy, from trainee teachers to governors. Each activity is accompanied by a PowerPoint presentation and presenter notes. Each film is accompanied by a written commentary outlining lesson strengths and possible areas for development. At SSAT, we know teachers and leaders in every school are striving to overcome different challenges to deliver a world class learning experience for the children they serve. Find out more about our in-school support in all areas of school improvement, including self-evaluation, leadership effectiveness, high-quality teaching and learning, accountability and data best practice and principled curriculum design. The support you need to develop a culture of high quality teaching and learning backed by academic research and evidence which drives high impact.